On average, how many of your government recommended 5-a-day do you manage to eat? Despite, or perhaps (in part) because of, my love of baking and this blog, I’m very conscious of getting my daily quota of fruit and vegetables. In the UK it’s fairly easy to stick to, with the government recommending a modest five 80g portions. However in Australia it’s seven, Spain eat eight and in Japan they suggest a staggering seventeen, although I’m guessing each serving size is slightly smaller than ours given that consuming over a kilo of even the most ambrosial fruit would be a struggle for most sensible human beings in any given day. I have my Mum to thank for my love of all things fruit and vegetables. Not only is she a wonderful cook, she champions local and home grown ingredients, often turning the most unassuming clutches of earthy veg into tangles of leafy deliciousness, brought to life by expert cooking and a squeeze of lemon, a sprinkle of salt or a drizzle of fruity olive oil. My Mum definitely knows her veg, she cooks it well and she also eats a lot of it. After university I spent some time living back home with my parents, a large proportion of which Carnivorous Boyfriend was also there for, having moved his life down to London to be with me. Any situation in which four fully grown adults are living under one roof has the potential for problems –I won’t even go into when my older brother moved back with his girlfriend in tow, bumping our household number up to six (my poor Mum) – but despite any differences, one thing that was always wonderful was sitting down to a family meal together at the end of the day. At the time we used to tease my Mum about her slight obsession. As dinner was served up several dishes would appear, showcasing not one, not two, but often three, four or more different types of vegetables. Nutmeg scented spinach, cauliflower puree, tender borlotti beans, leafy greens and every sort of salad under the sun – before Plenty was even the seed (no pun intended) of an idea in Ottolenghi’s mind, my Mum was churning out the kind of simple, delicious, flavour filled vegetable dishes that everyone should be eating on a regular basis. Now that Carnivorous Boyfriend and I live together and cook all our own meals, the tables have turned and it’s me who gets teased. Where once I thought my Mum was just a little bit crazy to serve so many different variations on veg, I find myself doing exactly what she did. While he loves (or says he does) all the different dishes I serve, if Carnivorous Boyfriend turned bachelor, I have no doubt that he could happily exist on a rotating fruit and veg diet of broccoli, bananas and frozen petit pois. Me? I like to mix it up – salads made from lots of leafy green veg, the finest shaved fennel, ribbons of carrot and cucumber or slices of freshly cooked artichoke, rich red tomatoes, roast cauliflower with cumin and grilled courgettes with chilli and mint. I could talk about vegetables all day and never get bored, but I won’t because you probably will . . .
And this is a baking blog after all (trust a little loaf to find a way to get her fix of veg from bread). The recipe below is brilliant for anyone who doesn’t quite get enough nutrients in their diet. Consumption of fruit and veg by Britains has historically always been pretty poor and (according to this article on Love Food) last year the Department of Health released a white paper showing that only thirty percent of us consume our daily five a day. That’s the equivalent to a glass of juice at breakfast, an apple after lunch and a couple of florets of broccoli for supper, so if that sounds normal to you, I’d give these muffins a try to at least begin to boost you daily intake. 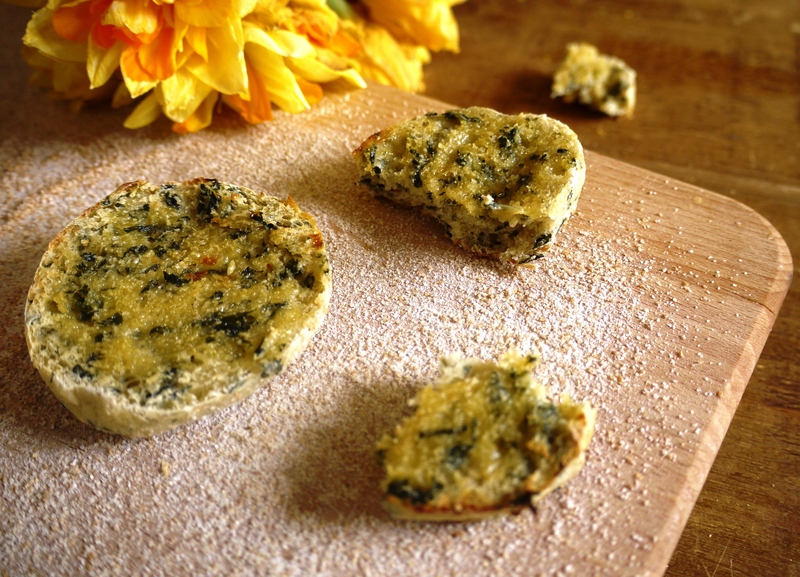 The recipe is adapted from the Spinach English Muffins in The Fabulous Baker Brothers book. The original recipe is delicious, but this is a lovely alternative, brought to life with a feisty kick of chilli and a handful of curly kale, rich in vitamins and chemicals known for their potent anti-cancer properties. We had these muffins for breakfast last Saturday, Carnivorous Boyfriend eating them alongside bacon and eggs while I topped mine with avocado, a little more chilli and a tangle of peppery rocket – the greenest breakfast I’ve ever seen. Because of the earthy green undertones, they’re also delicious with anything salty – paprika-laced chorizo, sundried tomatoes, crumbled feta or simply a slick of salty butter. The perfect weekend breakfast . 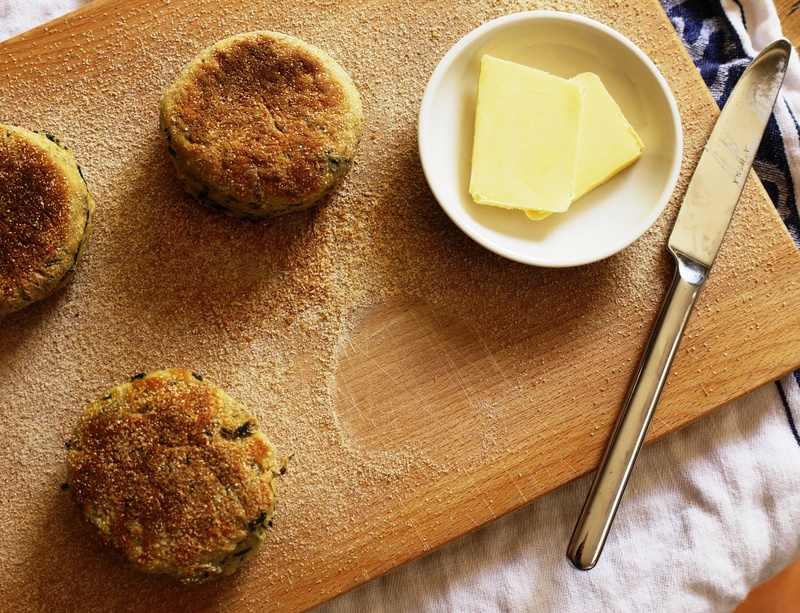 . .
Four heaped tablespoons of kale is the equivalent of one of your five daily portions, so eat a couple of these muffins for breakfast and you’re well on your way. Or don’t even think about the health inducing properties and just enjoy them for what they are. Popeye – and the Department of Health – would be proud. Heat the oil in a medium saucepan over a medium flame, then add the chilli and fry a couple of minutes to release the flavour, making sure not to burn. Add the butter and allow to melt, then throw in the milk and curly kale, stirring until the kale is wilted into the mixture. Set aside to cool slightly. Weigh the flours into a mixing bowl and add the yeast and salt. Add the tepid wet mix and work together into a dough before kneading on a work surface for about fifteen minutes. Your dough will be very wet at first. Once the dough is soft, smooth and elastic, put it into a clean bowl, cover and leave to rise for thirty minutes. Warm a heavy based saucepan over a low heat. Dust your work surface with the cornmeal or semolina then tip out your dough and gently stretch it out (don’t roll) until it has a uniform thickness of about 2cm. Using a 7.5cm cutter or similar (I used an inverted water glass), carefully cut discs from the dough then place them in the in the saucepan to dry fry, making sure they don’t touch each other. They will need about five minutes on one side before flipping and frying for a further three or four minutes on the other, although do check occasionally to make sure they aren’t burning. When ready, remove from the pan, break open and enjoy. These sound really delicious. I was lucky in that my mum always made sure we ate lots of fruit and veg and I still do, but even so, I feel I need to be more adventurous sometimes and I love the sound of these. 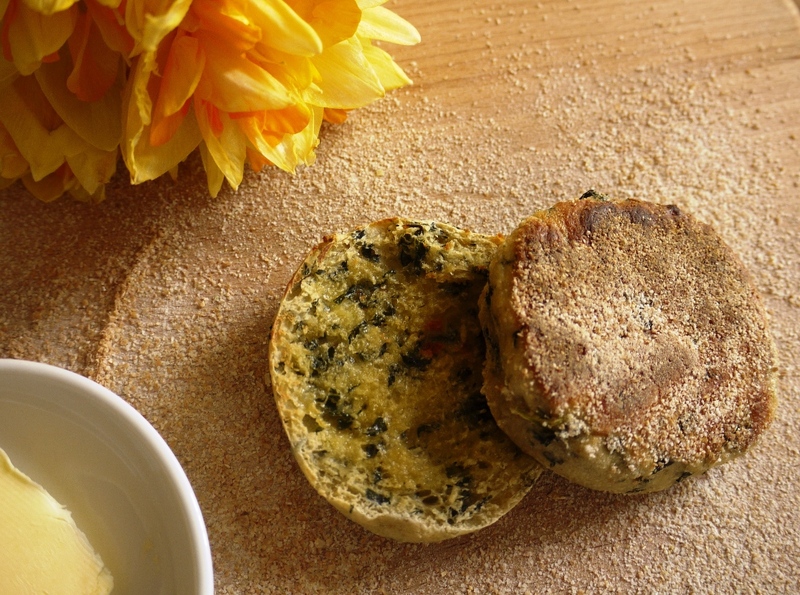 I love buckwheat flour at the moment and I love savoury muffins so this looks like a match made in heaven! This is my kind of muffin! I like my bakes savoury and boy this will taste yum with a poached eggy on top! These look divine! I was a vego-phobe as a kid and until only recently did not eat salad, mushrooms and many other foods I has probably never eaten before but decided they’d probably be rank! 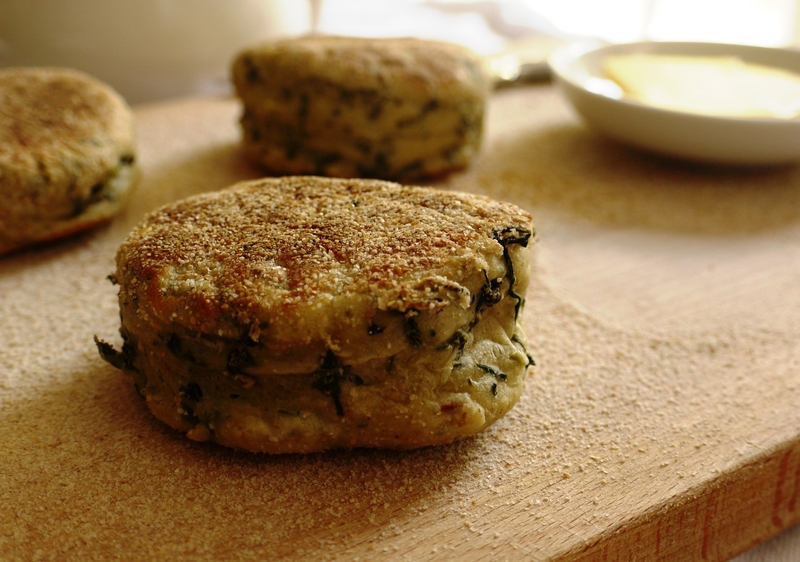 These look absolutely divine, I can see myself having these with a nice poached egg! Been looking forward to trying these out since you tweeted about them. Thanks for sharing the recipe! These sound like they shouldn’t work but I bet they do – and your photos look lovely. Can’t wait to give these a try! Corina – glad you like them. 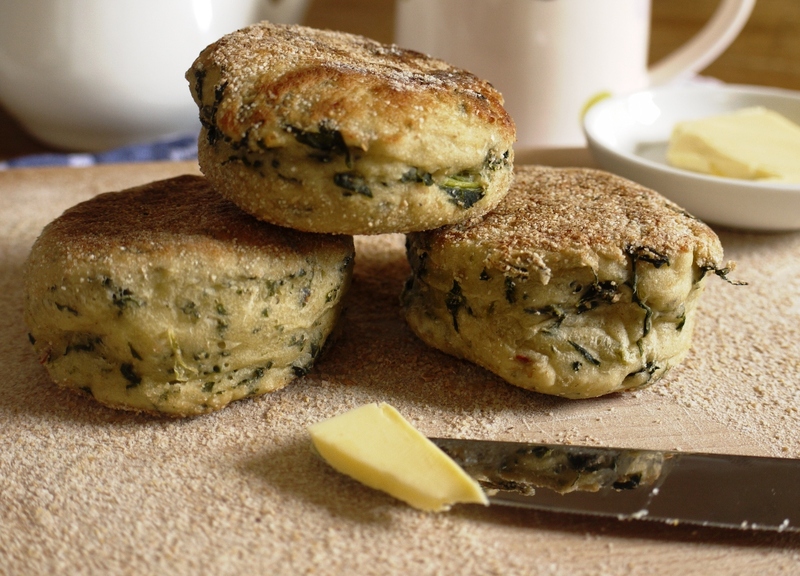 Even if you don’t need to eat more veg these are a delicious alternative to normal muffins! Choc Chip Uru – these are English muffins which are never normally sweet – you should give them a go if you can wean yourself off American muffins! Regula – haha, that sounds like a serious skill! Becs – thank you, my boyfriend will confirm that they are indeed very nice with a poached egg! Things My Belly Likes – I promise they do work, give them a go! What a great post! And these sound totally delicious. I am also currently obsessed with buckwheat and actually had buckwheat noodles with kale and chili for lunch a few days ago… this is like the breakfast version! It’s funny – 5-a-day isn’t anywhere near what we should be eating (it’s actually 9-10), different nations recommend different things. It’s fine in Britain because that’s all they expect they can convince us to eat. I for one think I get at least 4, but often far more, each day. My soup this evening has at least 4 in itself. anyway, these are about the best looking breakfast muffins I’ve ever seen. We also always loved vegetables although when I was a kid they often came from a can! I have one son who eats and loves all veg, the other hates them. Oh well. But as for kale I adore it and so does husband but who would have thought of using it in a muffin? I love it! I so want to try this recipe! They look great! These are a great plan! I tend to get fairly close to my vegetable recs, but sometimes you just have a day in which you sit around eating frozen pizza. Clearly having these on hand would help! Definitely a great way to get your five a day in. I’d happily eat a few of these and then feel virtuous. Bravo for experimenting! LOVE the look of these – they look so doughy and toasty and delicious. I like your idea of topping with avocado too. Also I am fascinated by the Japanese idea of SEVENTEEN portions of fruit and veg. I consider myself quite virtuous as I normally have around seven a day…clearly I shouldn’t move to Japan or I might be shunned! It’s weird how these things aren’t fixed – can anyone ever really know how much fruit and veg we should eat?! Elaina – it’s all about the buckwheat! Frugal Feeding – I know, it’s sad that people eat so few when there are so many delicious fruit and vegetables out there. Jamie – give them a go, it’s a fairly subtle taste so you could probably even convince the veg haters in your family! Shuhan – if you really like chilli do add a little more, it’s a fairly subtle spice. 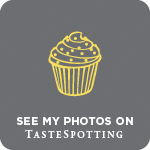 Baking Addict – thank you! Elly – seventeen is a crazy amount – I reckon maybe they include things like a tiny portion of pickled ginger, but who knows? Would be fascinated to find out. I watched the Baker brothers series, now it seems like I need to get the book. ; these breakfast muffins look amazing! I never eat a lot for breakfast but if I were to be served these, I wouldn’t mind, not one bit! I’m also a fruit and veg maven, although I didn’t get it from my mother… It doesn’t necessarily always come out on my blog, but I’ve always been passionate about good, whole, healthful foods and enamored by bountiful local produce. These are just so intriguing! I’ve never had an English Muffin this way before. They’re also quite beautiful. I definitely need to do a better job of eating more vegetables. I eat fruit like crazy, but vegetables are trickier. I love your method for sneaking them into baked goods! These muffins look fantastic! Your breakfast muffins look fabulous! I already eat a lot of vegetables, but as far as I am concerned there can never be too much of a good thing. I’ve had spinach in muffins but kale would never have occurred to me. I wasn’t a fan of the so called Baker Boys in the episode of their show I watched (I was hugely let down their name wasn’t actually “Baker” for one thing) but I would definitely try eating one of these. Sacha – you should definitely try them out – so quick and simple and infinite flavour combinations. Just gorgeous- and the idea of topping them with avocado is sublime. These look awesome. I am such a fan of kale, and never would have imagined it in a savory muffin. Brilliant. I’m so grateful for your bold baking adventures. yum! I don’t eat veges enough… That’s why I try to eat fruits. But I don’t eat fruits enough, so let’s just say, I need a breakfast muffin like yours. I’m a big dessert girl….but I think I may just have to try this. Erin – thank you, glad you like them! Jesica – try them, they’re so delicious! Elizabeth – I love dessert too, but sometimes savoury is all that will hit the spot, especially at breakfast time! I love vegetables even more than fruit, so this post certainly did not bore me! Great muffins, although for some reason I have to add a few more tablespoons of flour, but the tastiest way to start the day.